Ctrl/CMD+Click to select or unselect multiple search terms. Hayden is a very nice Gypsy mare. She has plenty of mane, tail, and feather along with a nice thick build. She has good size and conformation also. This mare is a fine addition to our group of broodmares and has proven to be an excellent mother. 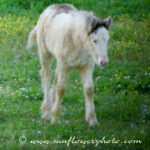 Her foals have not lacked in quality what so ever either and it is always exciting to see what she throws us next. Homozygous. 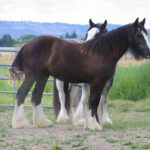 Horse carries two copies of the Tobiano gene. 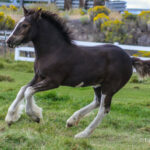 This horse will always produce Tobiano offspring. Heterozygous. 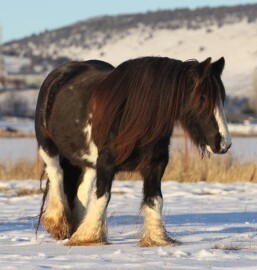 Horse carries one copy of the Tobiano gene. Homozygous. Lethal White Foal. 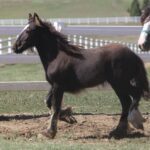 Horse was born with a lethal genetic intestinal disorder. Heterozygous. Horse carries one copy of the LWO gene. Horse will usually exhibit the frame overo pattern. Negative for Frame Overo (LWO). Homozygous. Maximum white sabino. Horse carries two copies of the Sabino 1 gene. Heterozygous. Horse carries one copy of the Sabino1 gene. Horse will exhibit sabino characteristics. Negative for the Sabino 1 gene. Homozygous Red. Horse carries two copies of the Red gene. Horse has a red base pigment. Heterozygous. 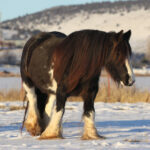 Horse is Black based but carries a recessive copy of the Red gene. Homozygous for Black Factor. Horse carries two copies of the Black gene. Horse is Black based. Non-Agouti. If horse is black based (E), black pigment will be evenly distributed. Heterozygous. Horse carries one copy of the Agouti gene. Homozygous for Agouti. Horse carries two copies of the Agouti gene. Homozygous. Double dilute. Horse carries two copies of the Cream Dilution gene. Heterozygous. Single dilute. Horse carries one copy of the Cream Dilution gene. Homozygous. Horse has two copies of the Silver Dilution gene. Heterozygous. Horse carries one copy of the Silver Dilution gene. Homozygous. Horse has two copies of the Champagne Dilution gene. Heterozygous. Horse carries one copy of the Champagne Dilution gene. Homozygous. Horse has two copies of the Pearl Dilution gene. Heterozygous. Horse carries one copy of the Pearl Dilution gene. Homozygous. Horse has two copies of the Gray gene and will always produce offspring that will gray. Heterozygous. Horse carries one copy of the Gray gene. Negative for the Gray gene.